On this Thanksgiving Day, may we embrace the ideals of compassion, tolerance, and kindness, and be thankful for the love of family and friends. I recently picked up Kate DiCamillo’s chapter book, Francine Poulet Meets the Ghost Raccoon, from our local library. It’s Volume Two in Tales from Deckawoo Drive. Familiar characters from the first book in the series, Leroy Ninker Saddles Up, can be found in the second book. Both books, illustrated by Chris Van Dusen, will appeal to young readers who are looking for something more than books in the I Can Read category. In Francine Poulet Meets the Ghost Raccoon, Francine comes from a long line of animal control officers. She has won trophies and holds records for the most animals controlled. Her father referred to her as the genuine article and solid like a refrigerator. Francine loves her job and does it well. Nothing frightens her. When Mrs. Bissinger calls for help to round up a ghostly-looking raccoon on her roof, Francine is on the job. But when the raccoon with its sharp teeth, high-pitched screaming, and odd looks charges at Francine, she panics. Fear seizes Francine, and she loses her perfect balance. A tumble from the roof lands Francine in the hospital with aches, pains, broken bones, and a severe case of fright. Francine loses her self-confidence and resigns from her animal control job. It’s not until a young boy, Frank, convinces Francine that she must face the raccoon to end her fears and go back to being the great animal control officer she really is. Frank cheers Francine on as she attempts to capture the wild raccoon. She remembers what her father said about being the genuine article and summons all of her courage to catch the raccoon. Success! Francine wins her struggle over panic and fear and finds a kindred spirit in Frank. In this book, readers learn that adults have fears, too. What I particularly like is that Frank, the young boy, understands Francine’s problem and convinces her to do what she must do. This is a funny and heart-warming book that I recommend. November is Picture Book Month. That’s always a great incentive to get my brain churning. I’m cleaning out the cobwebs and searching for picture book ideas hiding in the recesses of my mind. November is also Picture Book Idea Month, and this year I decided to take the challenge – thirty picture book ideas in thirty days. I need to pull out all the stops so my mind and senses are at their sharpest. 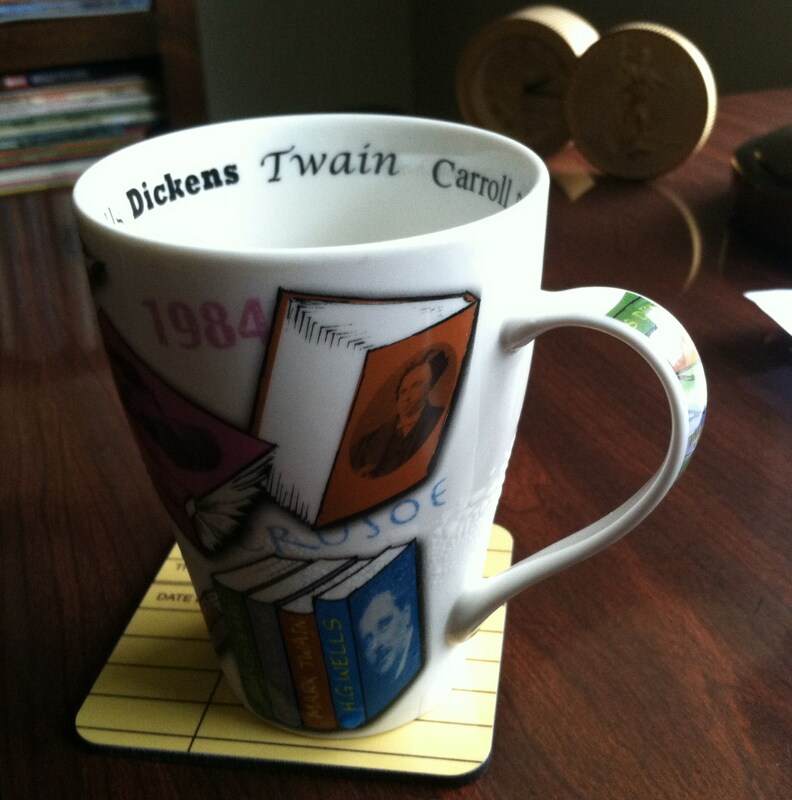 Author coffee cup = motivation. I know the basic elements of a picture book are characters, setting, plot, conflict, and resolution. But picture books are much more than that. Once the basics are in place, there are other challenges in order to produce a standout picture book. You need originality and a hook that grabs the reader’s attention in the first few sentences. Word choice is of the utmost importance as is the pacing in a picture book. Your story should have a story arc. It should flow easily and have an ending that satisfies. If and when you accomplish all that, you’re still not finished. It’s time to revise, revise, revise. Cut excess words and tweak for a tight manuscript that sings. It’s day twelve of PiBoIdMo. I have twelve ideas. Some may have potential. Who knows? I need to put what I know about writing picture books into action. It isn’t easy, but I’m up to the challenge. Are you? Make sure to check out Tara Lazar’s blog, Writing for Kids (While Raising Them), for some great posts by guest bloggers. Audrey and Don Wood‘s cumulative classic tale, The Napping House, was originally published in 1984. It has been a hit with young readers ever since then. If you love that book as much as I do, you won’t be disappointed with their new follow-up endeavor, The Full Moon at the Napping House. In the original tale, everyone is peacefully sleeping until an itty-bitty critter causes a commotion in the napping house. In the follow-up book, the same characters appear, but they’re not sleeping. They’re restless. No napping for them until another little critter comes along and chirps a full-moon song to calm the household. These delightful stories are a perfect pair. Both books are filled with amusing illustrations and beg to be read again and again. They also offer opportunities for readers to look for likenesses and differences between the stories. It just goes to show you that napping can be lots of fun!